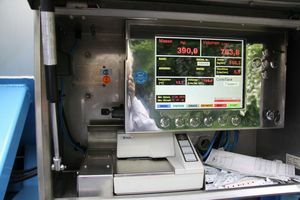 Corio T measuring system is intended to be mounted on LPG road tankers and is designed for measuring LPG (mass and volume) in real time during dispensing. The measuring system is certified according to European Directive 2004/22/EC of measuring instruments and is the standard feature on all our road tankers (distribution version). 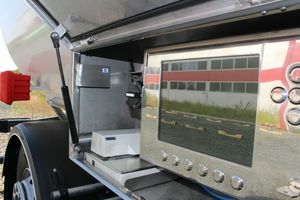 The system is equipped with GPS technology and on-line remote data transfer from the point of sale and immediate billing. Corio T system with high measuring accuracy (0.2%) provides immediate information on gas composition and quality by measuring the mass and density in real time and temperature. By printing those data on receipt, the customer receives true information about the product he buys, and its quality. 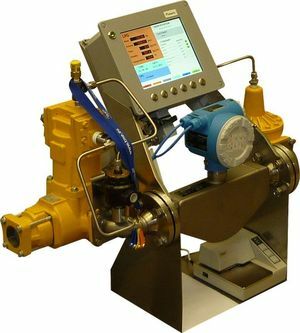 The measuring system consists of hydraulic part, manufactured by Endress+Hauser or Emerson, and electronic part – an evaluation unit type KMV3150-CorioTank for the evaluation and control of electronic outputs and inputs. The system is equipped with LCD display and printer EPSON. Immediate invoicing for the dispensed gas from the office of gas company.